This is my 100th post, can we believe it? 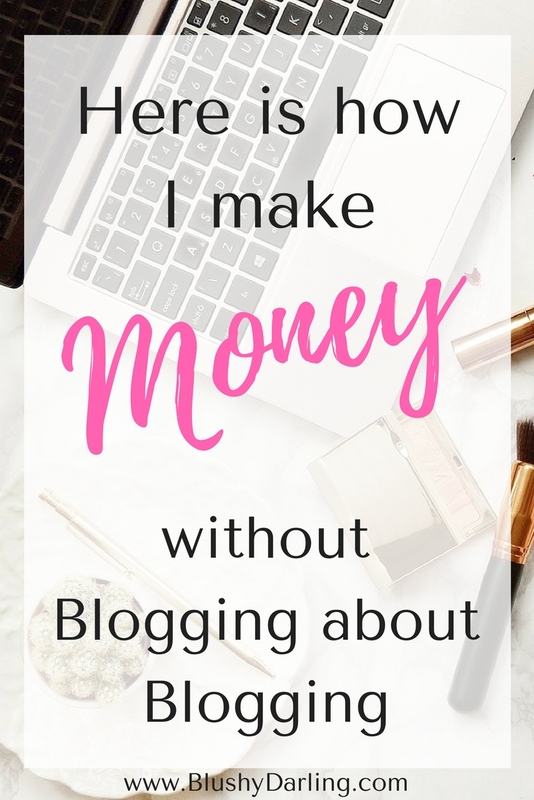 I’ve been running Blushy Darling for about 8 months and I’ve learned so much along the way but one of the first things I’ve learned is YOU CAN’T MAKE MONEY with your blog UNLESS you BLOG ABOUT BLOGGING. That being said I don’t blog about blogging, I’m still a beauty blogger and I’m not planning on changing anytime soon because guess what you can make money being a beauty blogger, you just have to change your resources, and be ready to not make them immediately but you can do that without paying a hell lot of money (like I did). In today’s post I want to tell you EVERYTHING that I use to run my blog and to drive traffic to Blushy Darling which I repeat is a BEAUTY BLOG and will always be, I’m just writing the post I wished to find when I started, plus, I’m always willing to answer your questions so feel free to ask away! God, I wish I knew that. Let me tell you what I did. I went on wordpress.com, paid to have my domain (I got the Personal Plan for 39$ per year) and THEN went self-hosted with Siteground WHICH cost ME (you can’t use Siteground for free) but I got my domain included in the price… See what happened there? Essentially I paid twice for my domain. You can see again a million posts that are promoting Siteground, saying amazing things about it, well, this is not one of them. I can tell you that I USE Siteground, I like it because they have a Live Chat assistance so if you are paranoid like myself you can bombard them with questions 24/7 (like I did) and they not only have to help you (which they are really good at it) but they have to be kind too! Other than that I like it because my Site never glitches or goes down, it’s still fast to charge, I can add whatever plugin I want or whatever theme I like without any problem. Their cheapest plan (which is the one I have) is 3.95$ per month. You don’t have to pay the per year, you can pay for 3/6/12/24 months so if you are as broke as I just know that it won’t cost you an arm and a leg to move your site. You can sign up with them and they’ll move the site for you, chances are that you’ll have to change your theme but other than that it’s super easy to switch. You will lose our post likes, they can’t migrate them, but you’ll still have all your followers and your comments. If you are a wordpress.com blogger, literally nothing is going to change, you are going to write the post on the same homepage, you can still use your app and have your posts in the Reader. The Reader is one of the best features of WordPress, most of the people who interact with my blog do it from the Reader and one of my biggest concerns before moving. Chances are that you saw this post in your Reader so guess what I’m STILL HERE. And I didn’t have to do anything to appear there. It happens automatically. At first, though, people couldn’t comment from it which was a huge problem for me, you’ll have to go on your Dashboard/Jetpack/Discussion and enable the “Let readers use WordPress.com, Twitter, Facebook, or Google+ accounts to comment” button. If you are just starting with blogging Amazon is what everyone recommends, it’s easy to sign up, they have everything and they accept almost anybody, that being said: I’ve never made a sale with it because: who buys a Maybelline mascara on Amazon when you can go your local drugstore? Plus their prices are higher than the drugstore and they don’t have high end stuff. So if you want to sign up you can do it but if you are a beginner you are not going to make sales with it. Harsh truth, sorry. You can add their plug into the site and they will make ALL of your links AFFILIATE. So even my first posts have affiliate links now and I didn’t have to change them manually and that’s because I put the links from sites that are in the Skimlinks server. They have a lot of beauty site already in their server so if you add a link from, let’s say Sephora or feelunique to your site they will make it AUTOMATICALLY affiliate. You can make ANY LINK an affiliate, so if the site you choose has not an affiliate program you can pick the link of the product you want and make it an affiliate. You just have to go on “Toolbox“, add the link you want and create the affiliate link. I got approved the first time I tried so I don’t know if you need to have specific requirements to join it. Do you need to spend a lot of money? No. I used to use PicMonkey to create my blog banners and pictures after it became only paid service I switched to Canva, I love it so much more and it’s FREE. As my camera I use my iPhone, all the photos that are on my blog are taken with my IPHONE and I’m so broke that I still have the IPHONE 5S so you don’t need a fancy camera to start, I don’t have it, what you need is GOOD LIGHTS! I’VE SEEN SO MANY BLOGS HAVING GREAT CONTENT BUT HORRIBLE PHOTOS and you know what, I’ve never read them again. A good photo needs to have good lighting and don’t have to be blurry. That’s IT! You’ll hear that sunlight is your best friend, true, but it’s not always there, sometimes, the light outside is just TERRIBLE so you’ll need a plan B. The first big purchase I did for my blog were box lights. I paid around 60€ and these are up to this day the best 60€ I’ve ever spent. I can take pictures whenever I want and wherever I want, they don’t take space at all because they stay in that bag and I’m sure that my photos will always have great lighting no matter what. 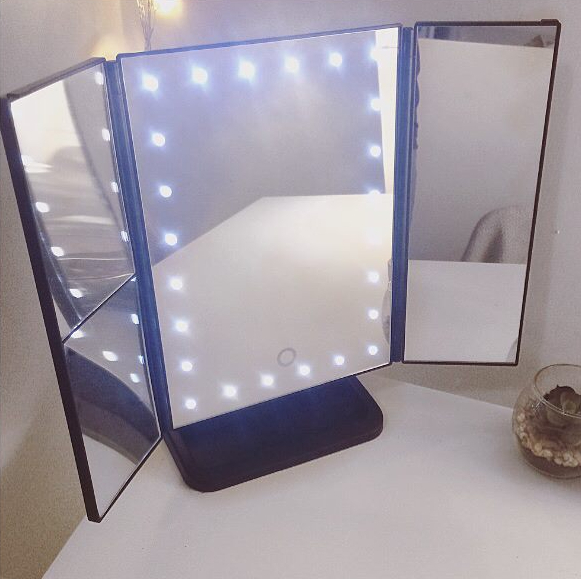 Another great light I have is my Gearbest Makeup Mirror, I use this EVERY TIME I do my make up and when I do close up photos of my looks. 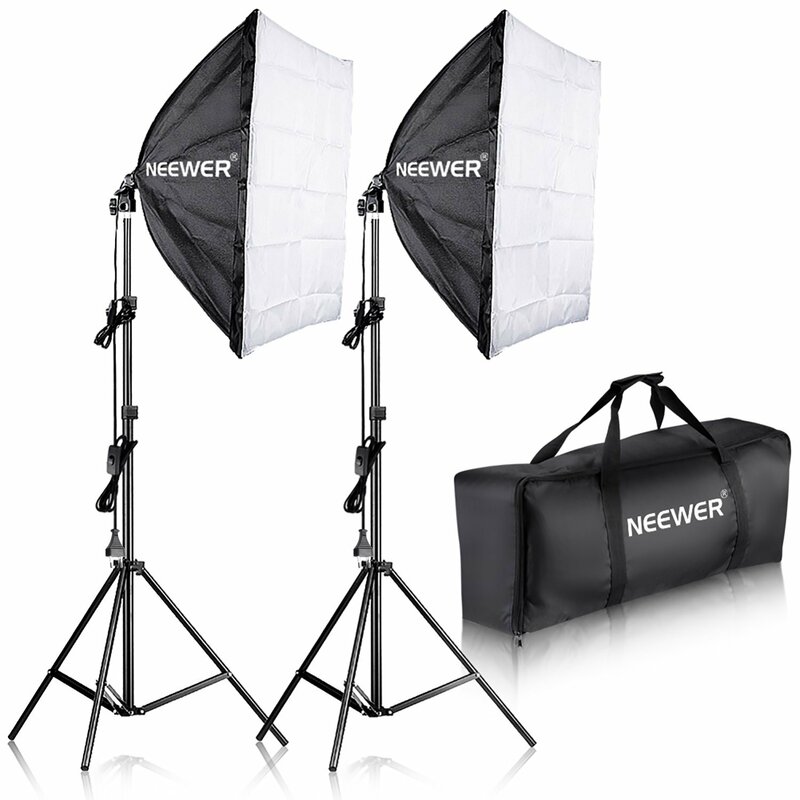 I love it, it’s super affordable and you can adjust the light to make it more or less bright. You can sign up to Google AdSense to add Ads to your site and your posts. I was so scared to do it because I didn’t want my readers to be bombarded and annoyed with a billion of ads when they were reading my posts because I HATE when blogs do that! But now I know, that you can do it two ways, the ANNOYING/LAZY WAY and MY WAY. You paste a code on your site and you’ll have ads everywhere. More money and you don’t have to worry of putting them in a post ever again. That was the lazy part. The annoying part is that your readers will hate you because you’ll have ads everywhere and it will be impossible to read your post. I have one ad in each post I write and one on my sidebar. That’s IT! I just have to remember to put it in each post and physically post the ad’s code in the HTML part of the article but that’s all. There are a lot of tutorials on YouTube that will explain to you how to put an ad in a post. Now you have the ads, you need to drive traffic to your blog. Because that’s how Google Adsense works your ads need to be seen and clicked to get paid. You have to build a community on your socials: Instagram, Twitter, Facebook and Pinterest but that’s totally up to you. I love to share a snippet of my life on Instastories but I’m not an Instagram person like those beauty girls, so Instagram doesn’t send me a lot of traffic, to be honest. I love Twitter! It’s my favourite social and I spend way too much time on it. A great way to get traffic from it is to follow some Retweet account: if you tag them in your tweet they will RT it to their followers and spread your post out. My Facebook page is my thorn in the side, I can’t seem to get traffic from it but what I use on Facebook are GROUPS! What groups do is create daily threads that you can participate to drive traffic to your blog and socials. They are a bit time consuming but they totally work. A few of my favourites are Growing Social Media For Bloggers, Pinterest Ninjas and Blogging With Heart for one specific reason: there are moderators that check if you complete the threads and if you don’t you get kicked out of the group that way people always reciprocate and you have some traffic guaranteed (As a matter of fact I recently become a moderator for Growing Social Media For Bloggers so if you want to join, you can find me there). Last we have Pinterest. EVERY. SINGLE. BLOGGER. will tell you that Pinterest is the way to drive traffic to your blog. Which is true, only if you blog about blogging or if you have a cooking blog. Well, If you are a beauty blogger it can work too. You need to make a few adjustments because most things won’t work the way they are but it can work. For example: if you blog about blogging long pins with a lot of catchy words are a must. IF you are a beauty blogger that same long pin with a bunch of photos will work A LOT better. 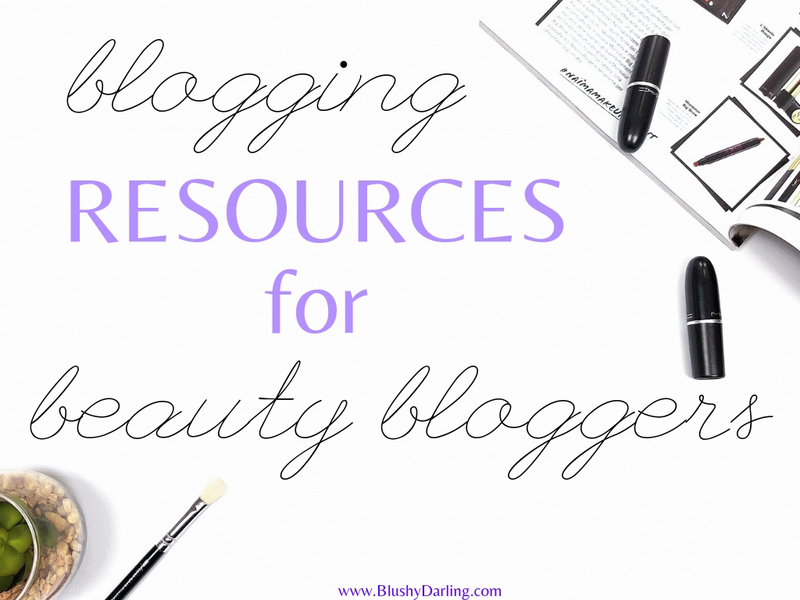 So the question is: Do you need a Pinterest course even if you ARE A BEAUTY BLOGGER? YES. I’ve used Pinterest for years but I’ve never used for my business. So I’ve learned how to do that. I learned about its statistics and how to pin to drive traffic to my blog along with many other things. I’ve read so many articles that were there only to promote Tailwind but YOU DON’T NEED TO PAY Tailwind to burst your TRAFFIC ON PINTEREST! You need a Pinterest course. I took Pinterest Ninja by Megan Johnson and I legit can’t recommend it enough. The course is super complete and it’s not an ad for Tailwind. She’s willing to answer all of your questions (I had a lot) and I also love that for most of the chapters she does mini videos to explain that subject. I’m a very visual person and videos help me a lot. I can’t say enough good things about it: you can get the course here and you can see everything that she will teach you. I’ve seen so many expensive courses, Pinterest Ninja costs 50$ which is a lot of money but honestly, it’s so worth it. I’m so broke and I’d still spend them. Oh my god, this is so freaking helpful! I literally can’t thank you enough! I want to go self hosted but It’s so overwhelming, and I was terrified of losing everything, not appearing in reader, etc but I have to check out siteground because it sounds awesome and your blog always looks amazing! This just answered a ton of questions and I think it’s a great post. Thank you again love! Thank you so much ❤️❤️ I defiantly will! Ah that’s awesome and thank you so much! These kind of posts are not really my thing but I wanted to help some fellow bloggers! What’s the plug in? Wow. I’ve been blogging for a few years now and still have stuff to learn! Thank you for this.